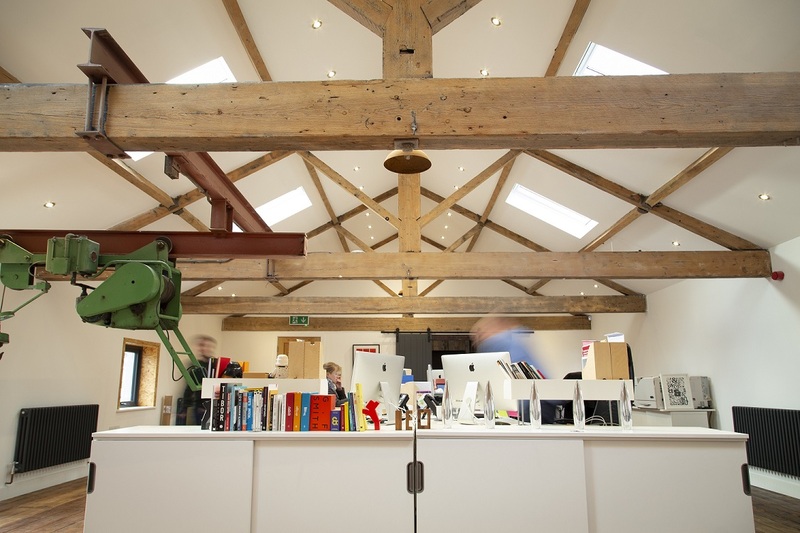 Following six months of hard graft, a six-figure financial investment and what feels like hundreds of hours of finishing touches, Design Network North Member The Engine Room has moved into its new home in Mirfield – York Mills. The former 19th century piggery – once owned by the employer of Anne Brontë – was purchased by The Engine Room’s managing director Lesley Gulliver and founder Darren Evans, in January 2017. The £225,000 investment was bolstered with £150,000 of funds – including £20,000 of support from the Leeds City Region Enterprise Partnership – to completely transform the mill into the company’s new HQ. And what was once a dark, mouldy and disused property is now a vibrant 4,000 sqft space, with the ground floor a bright, open-plan workshop environment open to local businesses. Keen to salvage as many on-site materials as possible, scaffold boards have been re-used for the centrepiece staircase, for instance, and the old mill door is now the boardroom table. The original wooden flooring covers the entire expanse of The Engine Room’s first floor office, in which the mill’s original industrial hoist is also a key feature. Outbuildings have been cleared to pave the way for a 12-bay car park, sectioned off with metalwork from the roof. The former car port is now the main reception and an adjoining cottage has already been let. Transformation of the cellar with brick-vaulted ceiling will continue in 2019. It is hoped that this space will be perfect for a number of small creative business lettings.